The first mention of Pereyaslavl dates back to 907 year in the Chronicle in agreement with Vyzantium, which was concluded after a successful military campaign of Prince Oleg on Constantinople. Since X - to the early thirteenth century Pereyaslav was one of the largest cities in Kyivska Rus (third after Kyiv and Chernihiv) From 1054 Pereyaslav was spreading from Oka to Don. The wise, courage pereyaslav Knyazes provides economical and cultural development of Pereyaslav Knyazivstvo. According to The Kiev Chronicle the first mention of the word "Ukraine" is connected with Pereyaslav. Pereyaslavl Ruses reached the highest peak during the reign of Vsevolod and his son Vladimir Monomakh. At that time the city started writing chronicles, a grand stone building , built a hospital, Bath, laid water pipe. In 1239 for the first time in its history, the city was taken by storm, destroyed and pillaged by hordes of Batu. It were destroyed all of the architectural monuments Pereyaslavl Rus. In 1585 the city was granted Magdeburg rights and its own emblem. The life and activity of hetmans Bohdan Khmelnytsky and Ivan Mazepa are closely connected with Pereyaslav. The Ukrainian philosopher and poet Hryhori Skovoroda lived here and taught in the Pereyaslav collegium. In 1943 Pereyaslav was renamed into Pereyaslav-Khmelnytsky. Since 1975 Pereyaslav-Khmelnytsky has been in the oblast subordination. In Pereyaslav is historical and ethnographic reserve composed by 371 historical and architectural monuments of Ukraine and the great museum of architecture and life in the open air unifying theme muzev 27. Pereyaslav rightly called a city museum. The museum was founded in 1964hoda. It is part of the historical and ethnographic reserve. In an area of 30 hectares located 185 objects are 104 monuments of folk architecture XVII-XIX centuries including 20 thousand. folk art products, tools and household collected in the forest-steppe zone of Ukraine. July 7, 2007 in the sent-Khmelnytsky was first held triathlon "Slavic Wave". Since then, the lexicon of triathletes, a new word - "Hvilyanman" So call those who finished in triathlon Pereyaslav and indifferent to the development of triathlon and a healthy lifestyle. In Ukraine, hundreds of cities. But getting into any of them, but in terms of chuvctvuesh themselves "at home". Pereyaslav-Khmelnitsky - one of those. Small - the size and population, but the vast - on history and tradition. The city has more than 1,100 years. He provincial modest, cozy, quiet. This age-old tranquility transferred to anyone dropping in for a weekend trip or on business. In Pereyaslav is something to see, there is much surprise. To do this, go there and see for yourself. This place - the territory of our national identity and history. And that words is not transmitted. But here's what happens Pereyaslav holidays, we are ready to tell you. Pereyaslav-Khmelnitsky - a city in which people live loving work. But pereyaslavchane able and beautiful holiday. Held annually in Pereyaslav festival events that unite the citizens in one big happy family. The City celebrates its own holiday - City Day "Glory, Pereyaslav-grad" in golden Autumn (the third Sunday of September). During the celebration the square and streets transform into exhibition and creative presentation arena. If you come to Pereyaslav, during all day you`ll see the celebrations – schoolchildren march-past, show “The Most Beautiful Pereyaslav Girl”, different concerts, greetings and exhibition of local business and art masters goods. You will be treated very delicious Ukrainian meal “Borsch in Pereryaslav”. The holiday are interesting for different tourists. Poetic Shevchenko word is living among Pereyaslav citizens. Along 10 years ago the city held an annual literary and arts festival "Pereyaslavska osin Kobzarya". There are meetings of writers and Shevchenko explorers with pupils and students, city competition of young performers poetic Shevchenko heritage, concerts, meeting with kobzars Kyiv kobza shop during the festival. The Festival of Folk Art «Lyne pisnya z narodnyh djerel» has a great success among the city's population. The amateur and popular folk groups of the city make these concerts. There are Ukrainian folk and modern songs and folk humor in their repertoire. The International Folklore Festival "Svitovyd" is hold at the museum of folk architecture of the Middle Dnieper every year. Folk groups from Belarus, Russia and Ukraine take part in this Festival. The folk traditions and attainments of different peoples are promoted here. It prefers folk home-made goods (pottery, beads, embroidery, paper decorations and Easter eggs, woodcarving, pottery and dolls) and embroidery, textile products of artwork factories. There are pottery and smithing lessons are hold. The Festival "Green Sunday" is hold at the Museum of Folk Architecture and Life of the Middle Dnieper. Green Holidays – Ukrainian name of the Christian holiday “Triycya” that is celebrated on the 50th day after Easter. Triycya was ending of the spring and beginning summer. It is a ceremony invocation future harvest. On the eve of Green Sunday, on Saturday (is called klechana) people decorate yards of museum houses with klechannya (green branches of maple, willow, linden, acacia, ash, walnut, oak, etc.). The branches are stuck in the roof, on the gate, near the windows, by the icon. The hostesses lay the herbs on the floor: sedge, lovage, mint and potion. There are youth fun and dancing are on the market square of the museum. Pereyaslav-Khmelnitsky invites visitors from all Kyiv regions to the Festival "Easter Childhood Song". It passes in the Museum of Folk Architecture and Life of the Middle Dnieper along 6 years ago. Recently the festival dance teams takes part too. The visitors can watch the exhibition of crafts, embroidery, pottery ware, painted eggs, pastries, etc. .. Children can be teached origami, clay modeling, beading and many other exciting youth activities. From 2008 Ballooning Ukraine Federation with the City Council held the baloon competitions “Balloon Pereyaslav-Khmelnitsky Cup”. It takes place in the early May. The foreign teams take part in these competitions. " Pereyaslav-Khmelnitsky Cup" is a four-day balloons festival. The morning (6.00-9.00) air balloons starts are hold from the "Museum of Folk Architecture and Life of the Middle Dnieper". The evening (18.00-20.00) air balloons starts are hold from the central square of the city. Residents and guests watch the balloons in the blue sky with pleasure. "Christmas carols" and “ Melanka Holiday "
Festival "Christmas carols" and "Melanka Holiday" are hold at the Museum of Folk Architecture and Life of the Middle Dnieper (scanscene, 7th of January) and in the central square (bright performance, 13th of January). Folk groups pass around homesteads and sing winter holiday rituals songs, including carols. It is caroling throughout Ukraine on Christmas. Children and adults (boys and girls, men and women) gather in Carol groups which include 3-4 to 9-12 participants. Each carol group has its own repertoire. For example, children bands usually perform special children's Christmas carols which differ from adult carols. They sing about agrocultural, family and household, wedding, military, fabulous and fantastic motifs and religious motifs. Carol groups wish wealth, health, a happy love, a good harvest etc. The caroling rite in Ukraine is a true spiritual treasure of nation, inheriting from ancestors from the deep and ever. KUPALA (Christian holiday) is celebrated in 6th of July in a Kupalska night. On the eve of the holiday the guys put large piles of firewood in a bank of the river Trubizh. Grandfathers have to spark the fire by primitive way. It believes that by jumping over the fire, you can get rid of diseases, evil magic and infertility. If the jump is successful you may have successful future life. The jump also shows early or late marriage. It is made a scarecrow (Kupala) doll in the center of the meadow. The girls decorates Kupala with live and artificial flowers, berries, ribbons etc. The girls drive dance around Kupala, sing songs about love, courtship, marriage future. Kupala night is assumed magic when evil wakes up. Hence, maiden guessing on wreaths, numerous rites and magic tricks by which cautioned against witches are spread here. They believe that herbs gathering at Kupala night have special healing properties. Triathlon is a sport of "iron" people; it is one of the most exhausting kinds of sports. The sportsman overcomes three phases – swimming, cycling and running in triathlon. "Slavic Wave" is a "half-iron" triathlon. Total distance is 113 km. First "Slavic Wave" was held in 2007 in Pereyaslav-Khmelnitsky. Thus, in June each year the International Triathlon competition "Slavic Wave" takes place. The sportsmen from different cities of Ukraine and Belarus, Germany, Russia, USA, Australia, Austria, Bolivia, Moldova come to Pereyaslav to measure their strength at a distance 1,9 km swim + 90 km bicycle race + 21,1 km running. More than 100 participants from the youngest (19 years old) to the oldest (56 years old) take place in the competitions. Festival " Vodohresce " (January 19) in Pereyaslav passes near a forest lake and has regional significance. On the eve day it is cut down a large cross in the ice, the priest hallows the water and plunges back cross, then it is considered holy. Holy water is credited with miraculous properties. Ill people and sick animals are treated with holly water. More than 500 persons come to the forest lake and all of them want to plunge into the cold water. Every visitor may be treated with a glass of complimentary hot tea and tasty porridge. On the Children's Day it is an annual festival of children's art. The Central Square and park are opened for different interesting children entertainment. There are games, competitions, fantastic journey, creative talents concerts, star parade in the centre of the city. Pereyaslav presents celebrations its young residents. Pereyalav lived hundreds of years before us. And there will be many centuries to live and stand on the banks of the Kanev Reservoir. 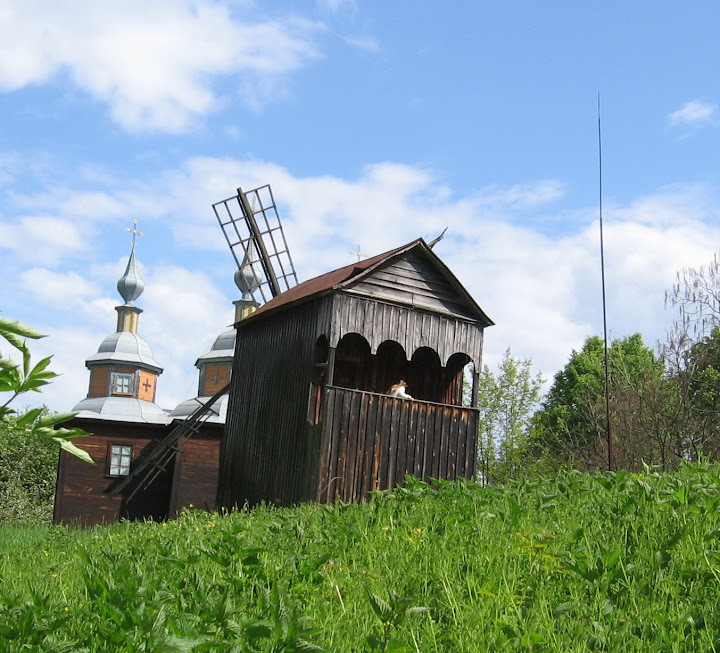 So, hurry to see this wonderful place where born and died famous peoplе, where Taras Shevchenko wrote "Zapovit" , birthplace of Sholom Aleichem and buried Vladimir Monomakh. Hurry up, because life is something we are not eternal!